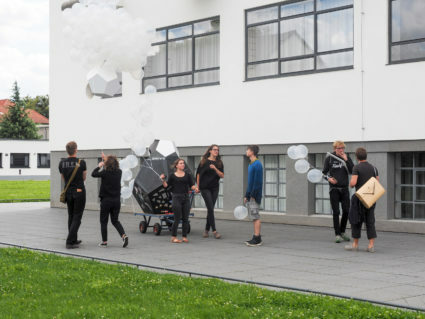 In the spirit of the annual theme, “Movement”, in the Bauhaus summer school 2016 we offered a workshop dealing with Co-Machines – moving objects in the ur- ban scope. 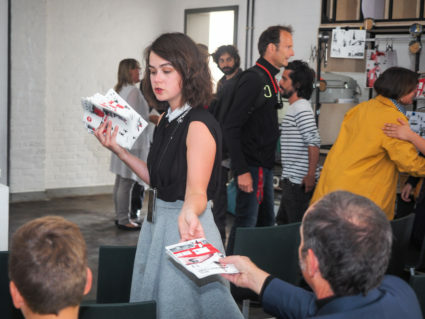 The workshop invited young participants to develop their own action-machine, analysis and ex- perience to solve situations of everyday life and help to re-shape the city. 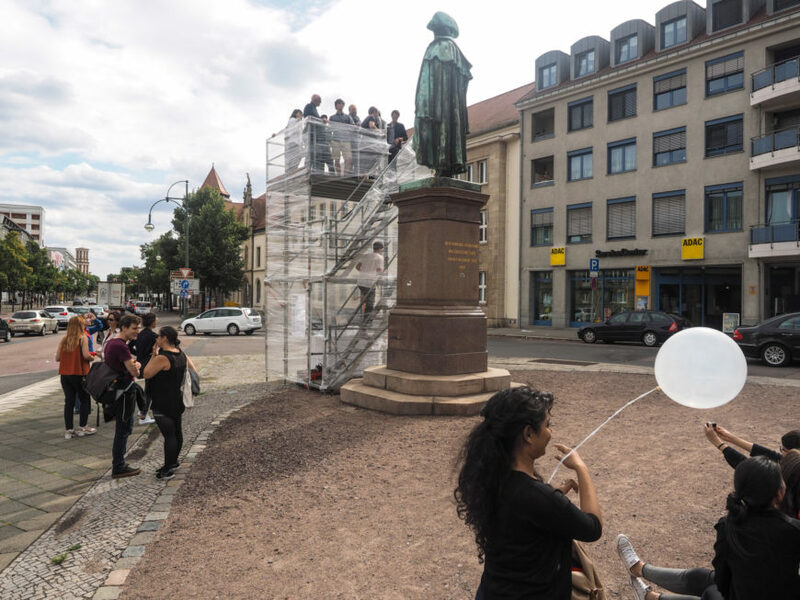 Together we built “Co-machines” – small interventions that are carried by curiosity and desire and serve as a tool to explore the city and to interact with it. 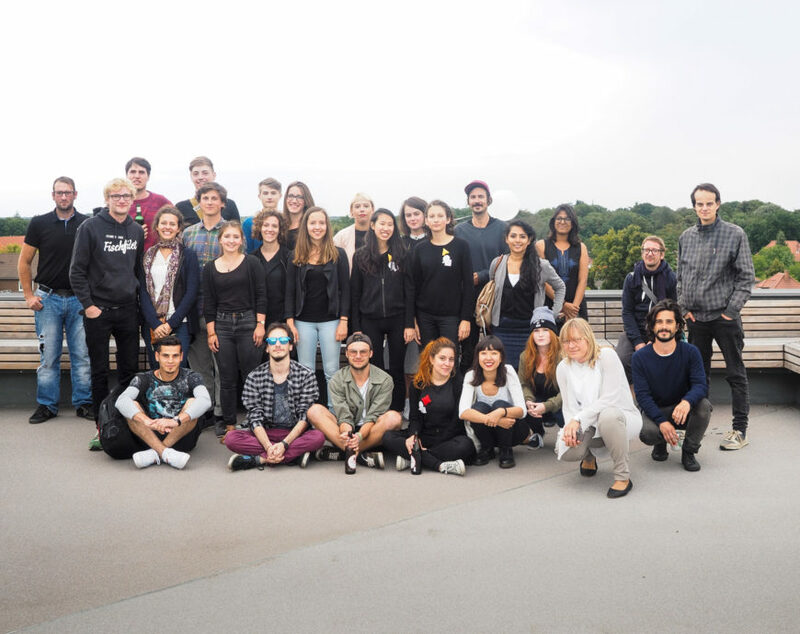 Since 2009 the Bauhaus Dessau Foundation arranges annual international summer schools in Dessau for international students of architecture, arts, design, urban planning and cultural sciences, who are interes- ted to work in design, art and craftsmanship. 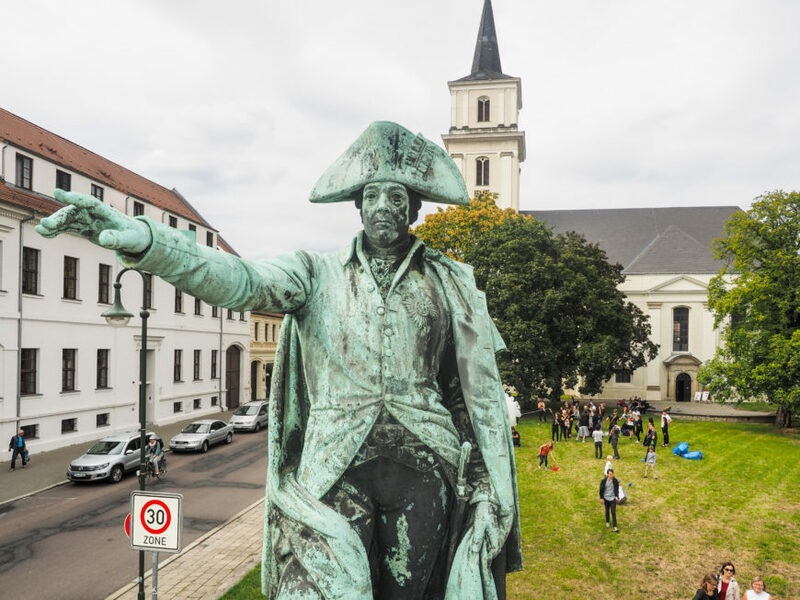 Franz Zeigt Auf is a temporary platform Dessauer can come into direct contact with their esteemed Prince Franz. Built up in all public places and equipped with an instruction manual, the machine “Potli Pockets“ turns shirts into bags in less than ten minutes. 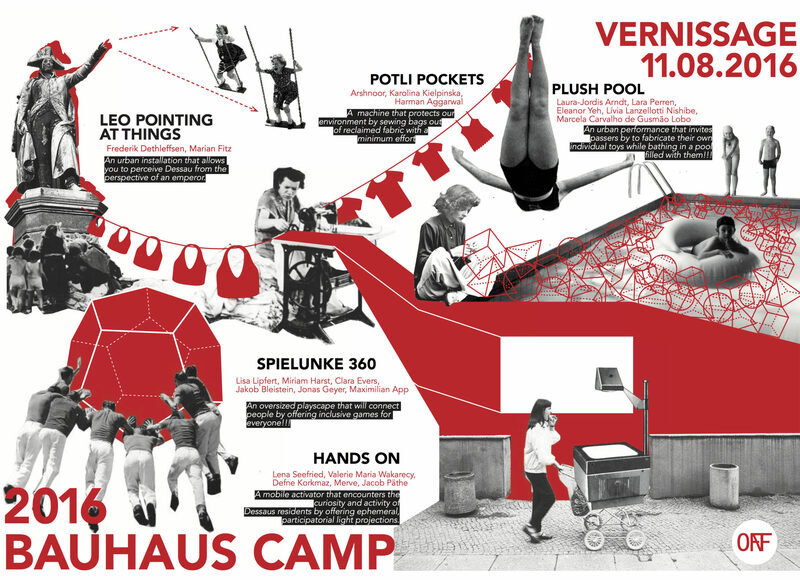 Hands On Dessau enters dark places and projects the not so prestigious motives of the city. The original geometries of Moving Eder will allow movement in different ways and make it tangible: rolling, casting and fly. 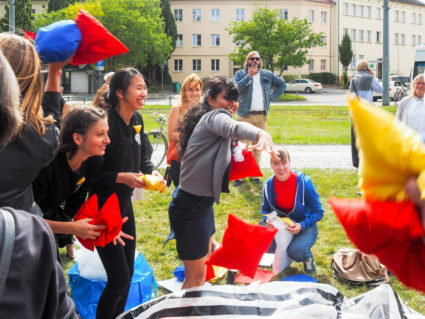 The cushion filled Power Plush Pool is a public toy that aims to bring together people of all ages and backgrounds. Our contribution besides teaching was to collect, document and spread the students ideas, interventions, instructions through a zine. 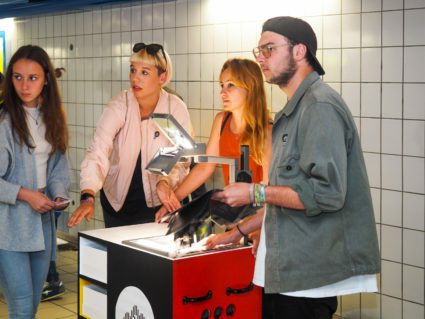 Therefor we built The Guerilla Press – a machine designed to collect all the ideas from this workshop and make copies for all the visitors to the exhibition. It consists of 4 modules. Compactly arranged they can easily be rolled to a project site when needed. 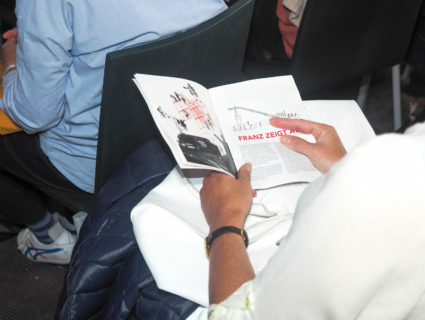 For printing, it can be unfolded into it’s components to create a publishing house on wheels. 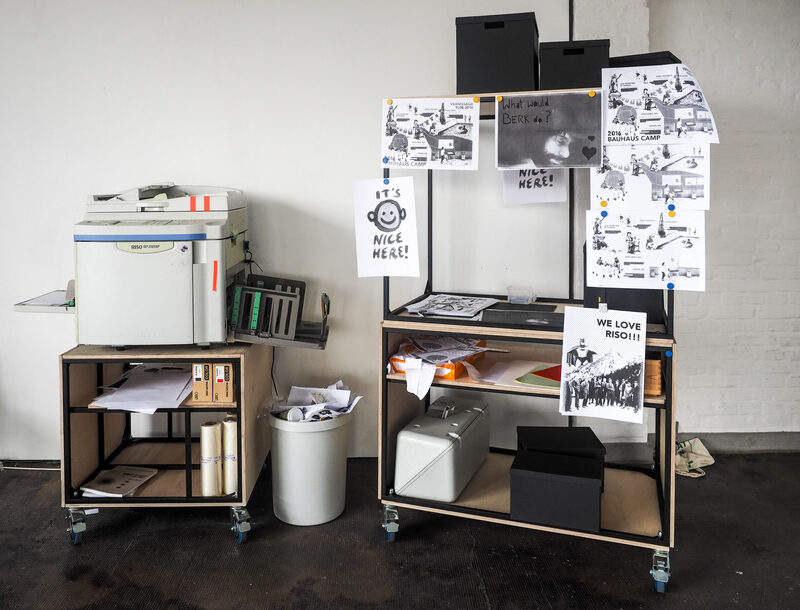 The Guerilla Press is made from steel and holds a Riso Copy-Printer as it’s engine which uses DIY ideas as fuel. 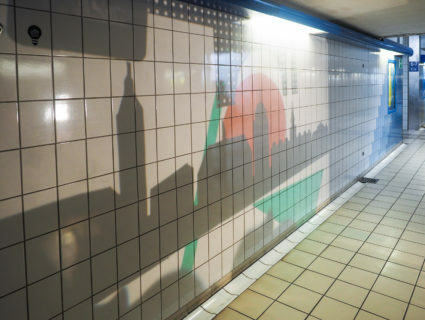 A project by Anika Neubauer, Dan Dorocic, Berk Asal and Halina Rachelson. 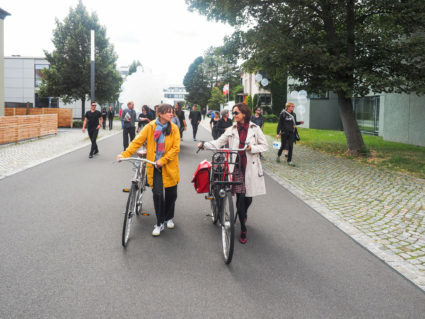 Thanks a lot to all the participants: Lena Seefried, Valerie Wakarecy, Defne Korkmaz, Merve Yilmaz, Jacob Päthe, Arshnoor, Karolina Kielpinska, Harman Aggarwal, Lisa Lipfert, Miriam Harst, Clara Evers,Jakob Bleistein, Jonas Geyer, Maximilian App, Laura-Jordis Arndt, Lara Perren, Eleanor Yeh, Lívia Lanzellotti Nishibe, Marcela Carvalho de Gusmão Lobo, Nikoloz Sikharulidze and Jutta Stein from the Bauhaus Dessau Foundation!